All transactions are safe and secure with a reliable history in online purchasing behind each of our associates. Buy the Bruce Lee Kick t-shirts to own Bruce Lee clothing and merchandise. 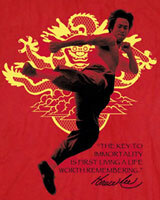 This Immortal Dragon Bruce Lee t-shirt features Bruce performing a flying kick, as seen in movies like Enter the Dragon. The image of Bruce kicking lies on top of a gold dragon. At the lower right corner of the design is the Bruce Lee quote, "The key to immortality is first living a life worth remembering." Pair it with an Ilse of Han (Shih Kien) tournament design that promotes the mysterious island martial arts tournament. Wear this cool tee so that your friends know you're a bad mofo. In addition to the Bruce Lee Kick tees above, browse the Bruce Lee Clothing Gallery for more apparel like men's and women's clothes, kids shirts or hoodies.